The Equal Spaces Project in South Africa recently launched three “Learning Hubs” with over 30 participants in three South African cities. Two of us also connected by skype from Canada. 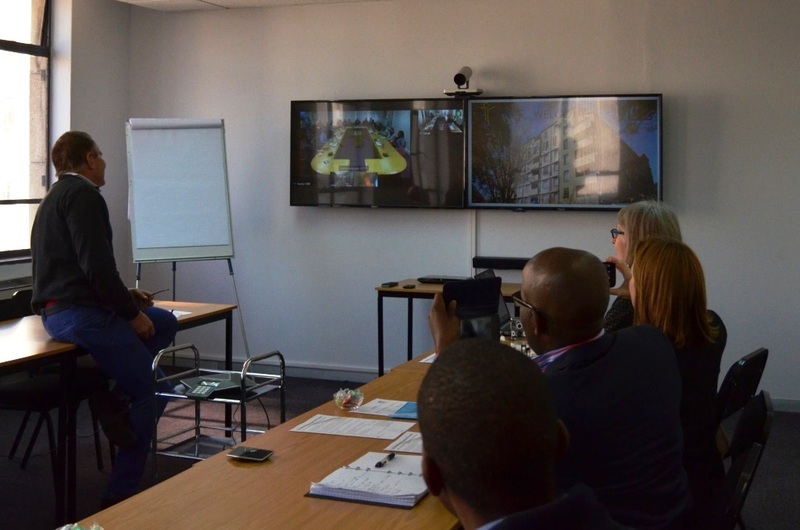 The new video-conference facilities are hosted by the National Association of Social Housing Organizations (NASHO) in Johannesburg, and two social housing institutions – Communicare in Cape Town and SOHCO in eThekwini. John Mofokeng from NASHO and Jo Ferris-Davies from the Rooftops Canada Equal Spaces team, also outlined plans for Learning, Innovation and Networking programs using the three hubs. One of the very exciting ideas is to help all categories of social housing employees to meet, share experiences and develop new ways of going about the business of providing decent, affordable housing. Due to the costs of travel, this has often been restricted to senior managers, but can now include other staff such building supervisors, community development workers and credit controllers. Not unexpectedly, there were a few technical glitches and everyone needs to get used to the technology. An upcoming workshop to share ideas for a gender equality strategy for the social housing sector will be a good test. We’ll let you know how it goes in our next post. This entry was posted in Global Affairs Canada, International Development, Social Housing, South Africa. Bookmark the permalink.